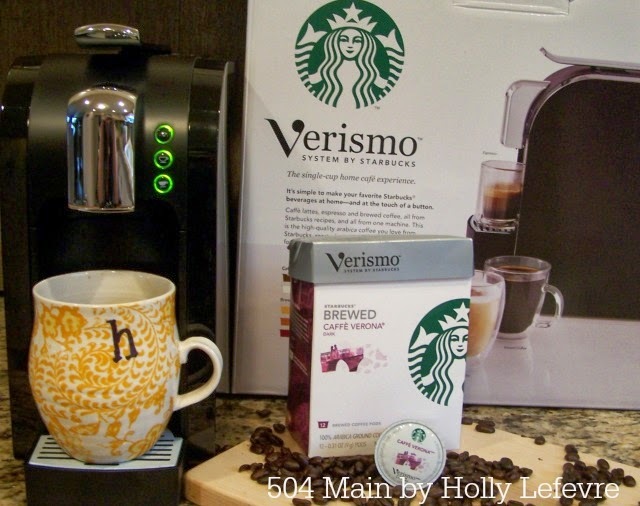 504 Main by Holly Lefevre: Let's Talk Coffee: Starbucks Verismo 580 Brewer Review and GIVEAWAY! 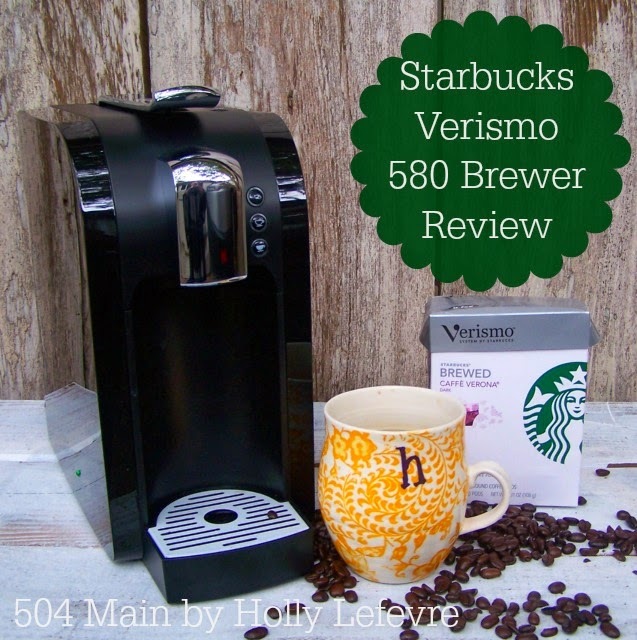 Let's Talk Coffee: Starbucks Verismo 580 Brewer Review and GIVEAWAY! My morning coffee takes me to my happy place. So does my mid morning, afternoon, and evening cup! Starbucks Verismo 580 Brewer to find its way to my house. Yep. I was a hold out...But no longer! Thanks to Staples, this gorgeous brewer has a permanent place in my home. Why had I not purchased one of these machines before? Verismo Brewing System from Staples and I are now BFF's! How does the taste of the single serve brewer match up to a pot of brewed coffee? 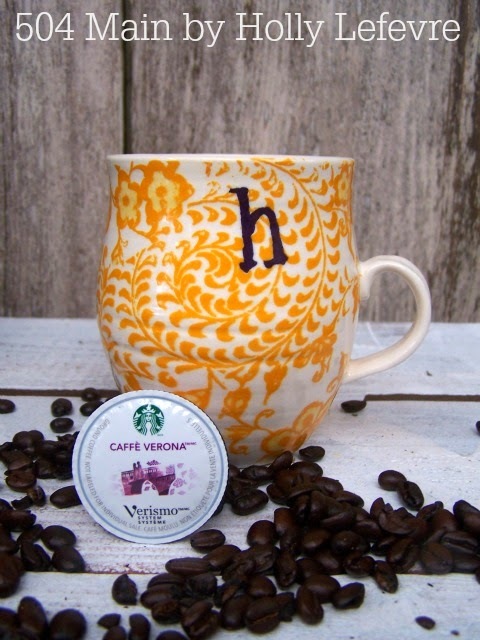 The Verismo offers pods for my favorite (and regular) coffee, Caffe Verona, which made comparing tastes very easy. The taste of the Caffe Verona from the Verismo didn't miss a beat...it was delicious. It was perfect! 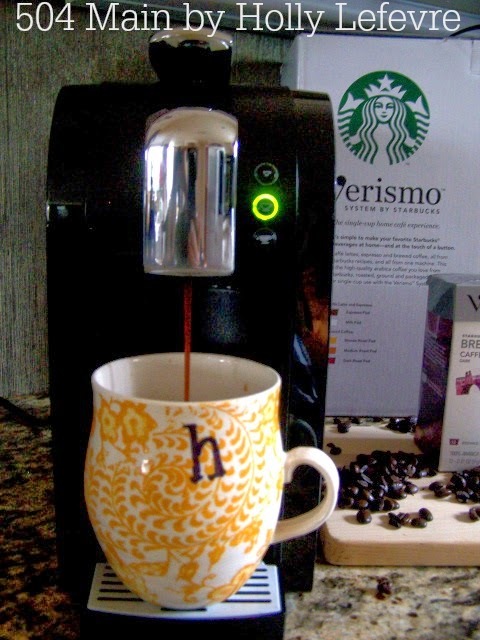 The Verismo also has the capabilities of making Espresso and steamed milk! This sweet little machine made everyone in my family happy...but especially me. Now, the true test...how easy is it to use? because, lets face it I cannot function until I have that cup of coffee! Position you cup: there is even a height adjustable drip tray for different size cups! 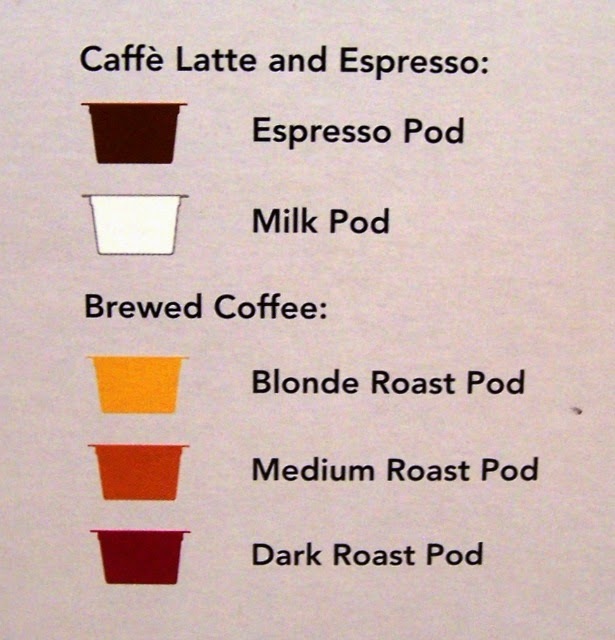 Select you brew type: Espresso, Brewed Coffee or Milk (for Caffe Verona, I selected Brewed Coffee). Watch the magic happen, in just about 15 seconds! The clean up is easy too - there is a built in pod receptacle. Just remove the pods after every use or when it is full. The rinse feature of the machine might be one of my favorites - no messy clean up! It is quick and clean and ready to go. Now here is you chance to WIN one! 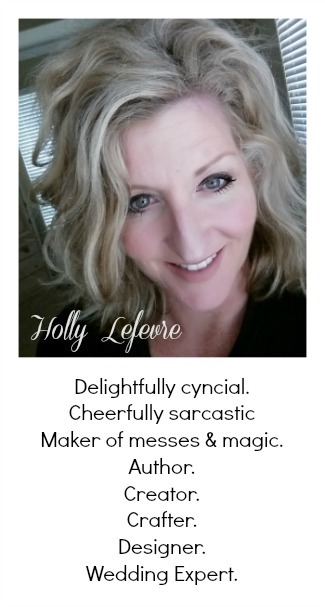 This post is written and created at 504 Main by Holly Lefevre disclosure: A Starbucks Verismo 580 Brewer was provided to me for review. All opinions are my own. I have been following along lately on all these different coffee makers since we have a vintage building getting redone and it will need an easy upkeep brewer. This brand is a new one for me to read about, but since I anxiously wait for pumpkin spice season, there is probably a way to knock one off before then! Soy latte is my favorite. grande raspberry mocha hot latte.....yum!!! French vanilla iced latte with a spritz of hazelnut! Non Fat Carmel Latte or during the fall the Pumpkin Spice Latte and during winter the Carmel Brulle Latte. I love their white chocolate mochas! I like there iced coffee. I love their caramel macchiatos. I'm boring,I like a good ol' caramel latte. Hmmm, I like the looks of this machine and what really got my attention was the rinse feature!! This one does stand out a little over some others. As for my drink of choice? Chai Tea!!! It's the bomb! I wish they made salted caramel mochas all year! I like vanilla machiatto, thank you for the chance. I love a caramel macchiato! Never been to Starbucks. Would love to someday! Vanilla lattes are my favorite! Peppermint Mocha is my favorite in the winter! And iced vanilla lattes in the summer! Iced Vanilla would be yummy! My fav is the iced caramel machiatto! YUM! I love their skinny hazelnut latte! Ohhh I haven't seen anyone actually review this yet so thank you for the review! I was curious as to the ease of use (compared to the Keurig which we have at our office). Will have to think about this for sure! Thanks for the giveaway too! I love their Skinny Mocha Fraps! I'm obsessed with the lime refreshers! Peppermint white chocolate mocha is my fave! Mocha Latte is my favorite. Just checking back in to see who was the lucky winner of your Verissimo giveaway! Where can I find that?